Would you trade in your Apple iPhone for a credit toward the purchase of the HTC HD2? 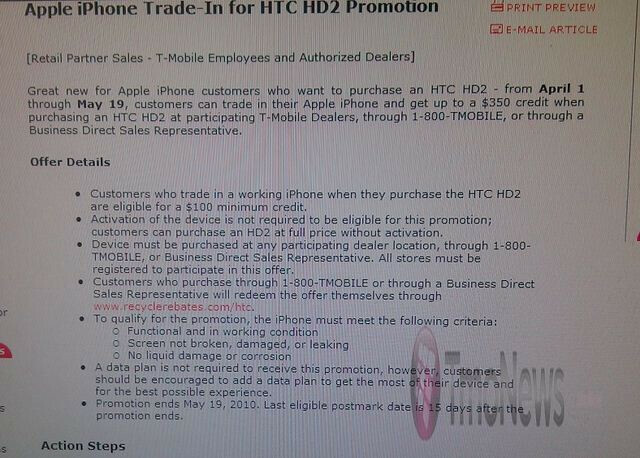 According to some internal T-Mobile communications, from April 1st through May 19th, you can score a credit of $100 to as much as $350 toward the HTC HD2 by trading in a working iPhone. The offer is not being made by corporate owned T-Mobile stores. The credit is available through participating authorized T-Mobile dealers, by ordering the HD2 on the phone at 1-800-TMOBILE or through a Business Direct Sales Rep. Those purchasing the HD2 through the latter two channels must handle the redemption themselves at www.recyclerebates.com/htc. To qualify for the credit, the iPhone being turned in must be in working condition and functional. The touchscreen cannot be broken or damaged and the phone cannot suffer from corrosion or liquid damage. Activation of the HTC HD2 is not required to be eligible for the credit. If you're tired of your iPhone and have been smitten with the HD2, here is your chance to make the swap and get some credit for doing so at the same time. We wonder what T-Mobile will do with the iPhones that it gets for the trade. Not sure if Iphone users would go for HD2. Very different experience. HD2 and EVO FTW! Give us your Lexus and we'll give a discount on the Corolla. This is probably an April fools joke. I saw this license plate yesterday that said "dig doug" and I want it.. my name's not doug, but I hear doug is awesome.. hmm that doesn't have anything to do w phones really.. droid ftw? The Iphone is a piece of crap. The HD2 is a far superior handset! It's more customizable, has a faster processor, and has many more features than the itoy. The Iphone is for those who only want what's popular and trendy, not for those who want a REAL smartphone. You guys may bash windows 6.5, but you can still do much more with the os than you can with the Iphone os. HD2 FTW!! Sounds pretty damn desperate to me. Who does that? HD2...great hardware...bad software decision. Who cares if its more customizable. I would take a more sturdy, responsive OS over customization any day. But again...nice hardware on the HD2. The HD2 would have been nice if it would get Windows 7. WM6.5 is pure garbage and HTC is struggling to hide the ugliness of WM behind an UI which in large parts have been 'inspired' by iPhone. If you take a look athttp://www.techtwurl.com you can get up to $180 for selling your iPhone 3G 16gb or for new iPhones like the iPhone 4 you can sell your electronic for up to $485. I have looked through many sites and I can say that Tech Twurl offers the best price and ease of use than the rest.